$2,590 Login For Price!PRICED TOO LOW TO ADVERTISE!!! 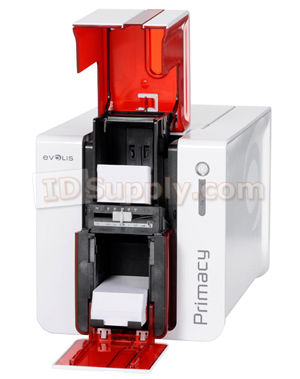 The Evolis Primacy Duplex features full double-sided printing. 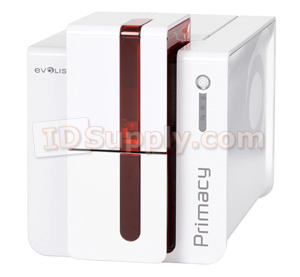 Evolis Primacy is a high-end printer that is easy-to-use, flexible and fast. When loaded with the Evolis cutting-edge encoding technologies, Primacy turns into the ideal solution to issue cards. Primacy supports any requirement in card printing and encoding, in medium to large runs. This is the perfect option to deliver transportation passes, payment cards, identification badges, as well as multi-feature cards. Includes the Evolis 3-year printer and printhead warranty! The Evolis Primacy Duplex delivers cards in runs, thanks to 100-card capacity input and output hoppers. These modules are conveniently located at the front of the printer and can be accessed easily and monitored at a glance. Primacy is the very first printer in its category to offer this level of performances through such a compact size and footprint. The printer also ensures top-notch printing quality at an unmatched printing speed. Shipped with the Evolis Premium Suite® software solution, Primacy makes self-adjustments when in operation. Users benefit from screen-based alert pop-ups, while 24/7 online help is available just a click away. Cards can be simply loaded at the printer’s front side. Ribbons are available in a cassette system that can easily be dropped into the printer. Each ribbon is automatically set and identified. The Evolis Primacy Duplex is an eco-designed printer. The energy consumption is on average 5 times lower than printers from the previous generation. The printer benefits from the ENERGY STAR certification and is compliant with the ErP directive. Primacy operates at a low 48 db sound level and, therefore, can be seamlessly deployed into any working environment. The Primacy benefits from the expertise and proven quality standards of Evolis. This enables optimized operations and perfect results. 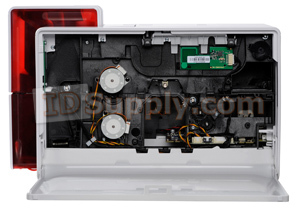 Evolis’ strong commitment to quality is legendary, and is echoed by a 3-year warranty. 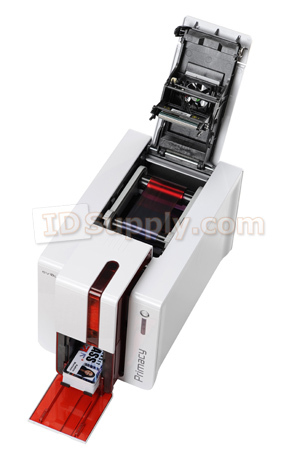 The Evolis Primacy Duplex comes with a three year printer (and printhead) warranty. To maximize the quality and durability of printed cards, the lifespan of the print head and the overall printer reliability, use Evolis Hight Trust ribbons. Graphical notifications from the printer(2): cleaning alerts, empty/low level ribbon and card alerts, etc.